Do you love a good meal in a “bowl?” I’ve got a fantastic new option for you! 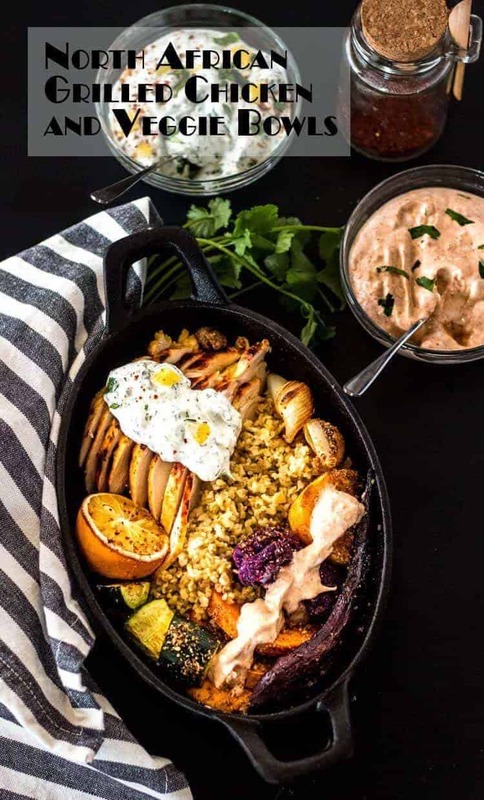 North African Grilled Chicken and Veggie Bowls are complete, nutritious, and super-flavorful bowls with North African components – roasted vegetables with dukkah, grilled chicken marinated in lemon juice and ras el hanout, a serving of whole grain, and a dollop (or two) of yogurt sauce! There’s a lot of flavor in this “bowl.” I combine a simple ras el hanout and lemon marinated and grilled chicken breast with a variation of my Roasted Vegetables With Dukkah recipe. 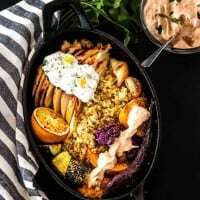 To round out this flavorful meal, I cook some freekeh (couscous, brown rice, or bulgur are great options too). The final touch is a duo of sauces – a simple harissa yogurt (recipe in this post) and a Moroccan Preserved Lemon with Fresh Herbs. Vegetarian? Sub roasted chick peas for the chicken breast. Toss chick peas with a drizzle of olive oil, ras el hanout, Aleppo pepper, and good sea salt. Gluten free? Sub brown or white rice for the freekeh! Paleo? Omit the freekeh, rice, or grain. Chicken isn’t your favorite protein? Try lamb or beef. Not your favorite veggies? Choose fresh, seasonal favorites. Keep in mind cooking times for each vegetable, and add accordingly. On photo day, I chose heirloom rainbow carrots, purple cauliflower, sweet potato, golden beets, shallots, and zucchini. I added the zucchini to the roasting pan after the others had a 10 minute “head start.” While the veggies roast, I start my grain, preheat the grill, and whisk up my sauce(s). You may wish to do one or both! This is rustic rather than fancy fare. Arrange sliced chicken breast and roasted veggies around a scoop of your prepared freekeh, rice, or grain (or omit entirely for paleo). Top with yogurt sauce as desired, and enjoy! Do you love a good meal in a "bowl?" I've got a fantastic new option for you! 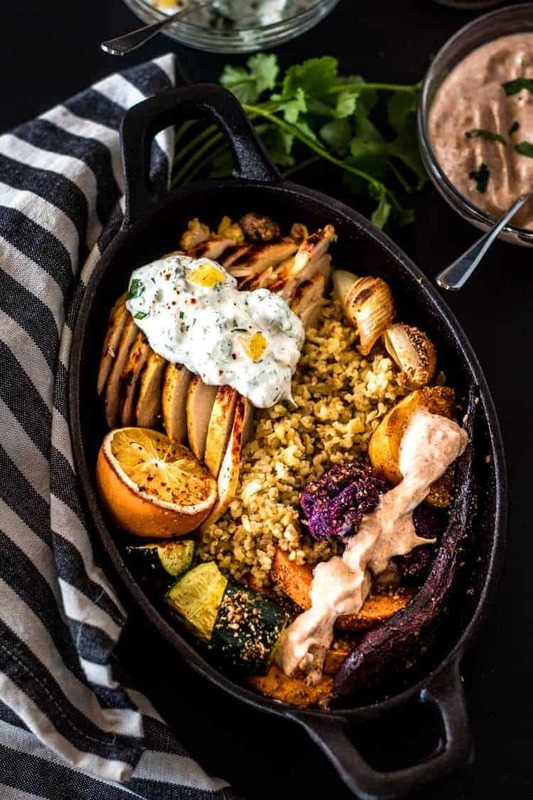 North African Grilled Chicken and Veggie Bowls are a complete, nutritious, and super-flavorful bowl with North African components - roasted vegetables with dukkah, grilled chicken marinated in lemon juice and ras el hanout, a serving of whole grain, and a dollop (or two) of yogurt sauce! Add marinade ingredients to a gallon zip bag. Pound chicken breast to even thickness (about 1/2"). Add to bag. Squeeze air from bag. Refrigerate 30 minutes or up to 8 hours. If your dukkah is not already made (from a previous meal or a commercial brand), add all ingredients to a small food processor and pulse until coarse crumbs are achieved. Over-processing may result in a paste (not what you want!). Preheat oven to 400 degrees (375 convection). Arrange veggies (except zucchini if using) in a single layer on a baking sheet. Drizzle with olive oil. Place in oven. After 10 minutes, add zucchini. Stir all the vegetables. Sprinkle generously with dukkah (about 1/4 cup). Return to oven. Stir again at 20 minutes. Cook until vegetables pierce easily with a fork, and edges are caramelized. Mine usually take 25-30 minutes total. Meanwhile, preheat grill, start freekeh (or substitute) according to package instructions, and make the yogurt sauce(s). For the Harissa Yogurt Sauce, simply whisk all ingredients together, and taste for seasoning. Grill the chicken (or substitute). If subbing chick peas for a vegetarian option, roast them with the vegetables. To Serve: Slice the grilled chicken breast. Divide among 4 shallow bowls. Divide roasted vegetables and grain/rice. Top with yogurt sauce(s) as desired. Enjoy! You can substitute chicken thighs or other meat. I pound the breast to even thickness (about 1/2" thick). This allows for more even cooking (ie. under-cooked portion and over-cooked portion). For a vegetarian option, roast chick peas with the veggies! (See post). I use whatever nuts I have on hand for the dukkah. I always have slivered almonds, and they're super easy and affordable. The recipe makes about a cup, so you'll have quite a bit extra. Store in an airtight container in your pantry. 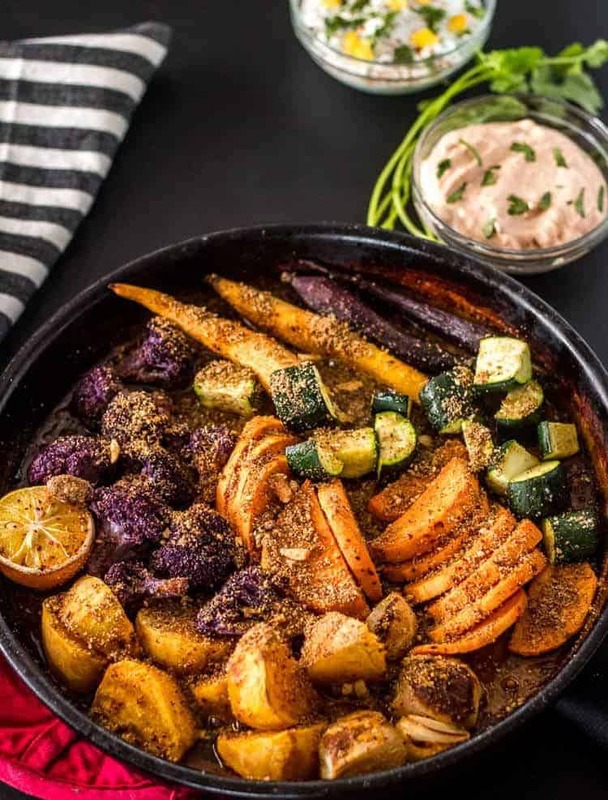 For the veggies: The key to awesome roasted veggies is to prep them in similar sizes, and cook them the appropriate amount of time. In this instance, I did a lengthwise slice on the fairly young rainbow carrots, half moons on the sweet potato about 1/2" thick, and thin wedges on the beet. With the sweet onion, I use the outer sections, and cut them in wedges, saving the interior for stock or other use. The zucchini gets cut in half moons and 1/2" thick slices, and is added 10 minutes after the root veg. I love freekeh with this dish, but you can sub brown rice (gluten free), bulgur, couscous, farro, etc. Cook with broth or water according to package instructions. The other yogurt sauce pictured is Easy Moroccan Preserved Lemon Yogurt Sauce with Fresh Herbs. It's delicious, but requires preserved lemons. Make your own, or buy them ready-made. They're a great addition to your well-stocked pantry! Macronutrients (approximation from MyFitnessPal.com): 269 calories; 32 g protein; 17 g carbohydrates; 8 g fat. Macros based on 6 servings with my specific vegetables and does not include freekeh or other grain. What is that lovely purple veggie? Is that cauliflower or a relative of it? The dish looks wonderful! So many flavors and colors that it is as much a feast for the eyes as it is the tummy! This dish is just gorgeous. I bet it tastes even better! The flavor combos sound amazing. What an amazing African dish!! The colors are beautiful, and the ingredients sound absolutely amazing. I have admittedly not ventured far into African cuisine. I am so wanting to try this! Thanks Sara! I do feel like African cooking has not gotten the international exposure it deserves... I'm trying to work on that! This is so many ingredients, but still sounds so easy! And that grilled citrus is totally calling my name. It really is easy to pull together Leslie! And yes, I adore grilled citrus! The flavor on this dish is off the charts good. The vegetables, spices and yogurt sauce have me looking at this for dinner ASAP. I love grilled chicken anything. This sounds so delicious. 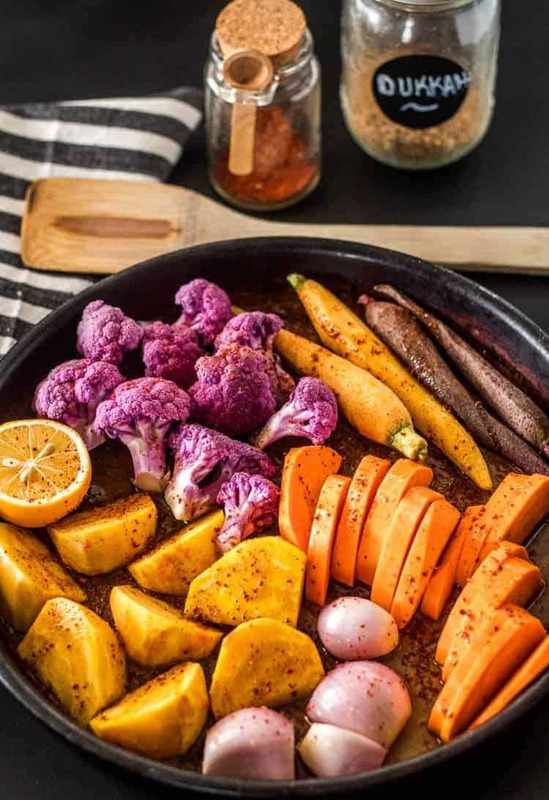 Love the flavors you have here and those veggies look like a treat. I love root vegetables so I'm all over this. Saving this for later. I hope you do end up giving it a try Veena! It's become a favorite at our house! The spice combinations sound incredible. I bet your kitchen smelled amazing when you cooked this? This recipe has some familiar flavors.like the dukkah. will try the recipe soon. I love dukkah, and keep a jar of homemade in my pantry for recipes like this one! This looks like such a flavorful and hearty dish! I've never tried African cuisine, but this dish makes me want to! I'm literally drooling over this dish! The spices and sides added look amazing. And the colors are beautiful! Thanks Dominique! I tend to eat with my eyes, and love colorful food! I get so excited when I come across African food. So much flavour..and the spice are amazing. This looks delicious...and I know the family would love it. This dish looks so delicious! I love the flavors, the vibrancy of the dish and how beautiful it is! I look forward to making your delicious recipe!